Udupi, June 30,2017 :Mohan Bhat, Mangaluru Divisional Secretary of Sri Rama Sene has said that his organisation was not ready to accept the statement of Pejawar Swamiji that some Hindus consume beef. "Those who consume beef are not Hindus," he asserted. Addressing a press meet here on June 30, Friday, he said the organisation would protest the offering of Namaz at the Mutt premises by holding a protest in front of Clock Tower on July 2. The activists would pray to Lord Krishna and sing Bhajans to share their woes, he said and added that the protestors would also pray to the lord to ensure that such programmes are not held in Mutt or Mandir premises. 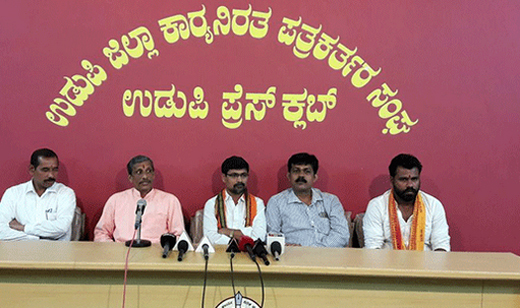 Hindu Jagrithi Samithi leader Vijay Kumar who also spoke, said the act of the Pejawar seer has hurt the sentiments of crores of Hindus and demanded that he apologised for the same. He also demanded that the Sri Krishna Mutt premises must be cleansed using Gomutra . Several Hindu leaders were present at the press meet.